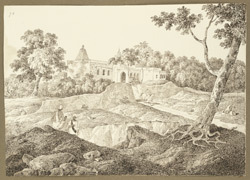 Pen and ink drawing of a view of the Thakur Dwara at Bodhgaya in Bihar, by Sir Charles D'Oyly (1781-1845), dated 27th December 1824. From an Album of 80 drawings of views in Bengal and Bihar taken between January 1823 and May 1825. D'Oyly arrived in India in 1797 and spent his first few years in Calcutta as Assistant to the Registrar of the Court of Appeal. He was Collector of Dacca from 1808-18 and was made Opium Agent at Patna in 1821. Whilst at Dacca he met the artist George Chinnery and became his pupil from 1808-12. D'Oyly was a prolific amateur artist who was greatly admired by the European community. He set up and ran a lithographic press, the 'Behar Lithography', and also formed an amateur art society the 'United Patna and Gaya Society' or 'Behar School of Athens'. Bodhgaya is a sacred site as it is where Buddha reached enlightenment whilst meditating under a large Bodhi tree. Gaya, located nearby, is sacred to both Hindus and Muslims.